Campgrounds are located along the San Joaquin River. Campsites have picnic tables, firepits, and bearboxes. 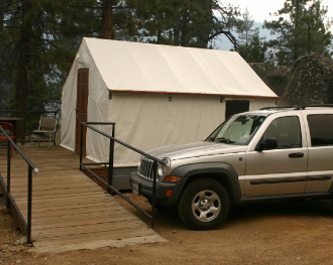 The Mono Hot Springs Campground is located just across from the resort along the San Joaquin River. 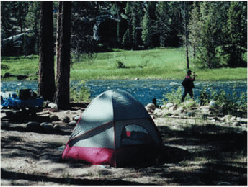 This ideal Forest Service campground is operated by California Land Management(CLM). Reservations can be booked six months in advance of your chosen arrival date on the ReserveAmerica website. Click here for Reservations Campsites fill up fast in July and August, so it’s recommended you reserve way in advance, if possible, the day your chosen date becomes reservation eligble. Of the 23 campsites, only two are on a first come, first serve basis. A Change in policy has locked the gates to the Mono Hot Springs Campground the end of September, whereas, previously the campground was left open throughout October. Understanding that mid-September through October is prime trout fishing season, we decided it would be helpful to have a fall special on our Tent & Camping Cabins for people that normally camp at Mono Hot Springs. Starting September 26 through October all tent cabins (up to 7 people) and camping cabins (up to 4 people) are available for two nights or more at 25% off per night with free use of the Resort Hot Springs Bathhouse and Spa ($10 value per person per day). Click here for more information.